A Winter Storm Warning continues for South Jersey and the Jersey Shore, where we'll see the biggest snow totals. Meanwhile, only snow showers are expected in far North Jersey Saturday. Another round of snow is upon us. The edge of a coastal storm system will brush past New Jersey on Saturday, providing an extended period of moderate to (possibly) heavy snow. Because of the storm's track along the Atlantic seaboard, southern and coastal parts of the state will see the heaviest, steadiest snowfall. Travel may be very difficult during and after the snowfall. Compared to our previous forecast, the snow forecast has been tweaked upward slightly, statewide. There has been considerable uncertainty surrounding this storm's track, and whether or not heavy, convective snow bands would encroach upon New Jersey's shoreline. Models are settling on a solution that does put healthy snow over the southern coast (at least), so this is going to be a significantly snowy day for part of the Garden State. Our latest snow map uses the same color contours as Friday's version, but the numbers have been increased across the board. You'll notice the snowfall total ranges have become narrower - that reflects growing confidence that we'll end up on the higher end of our initial thinking. 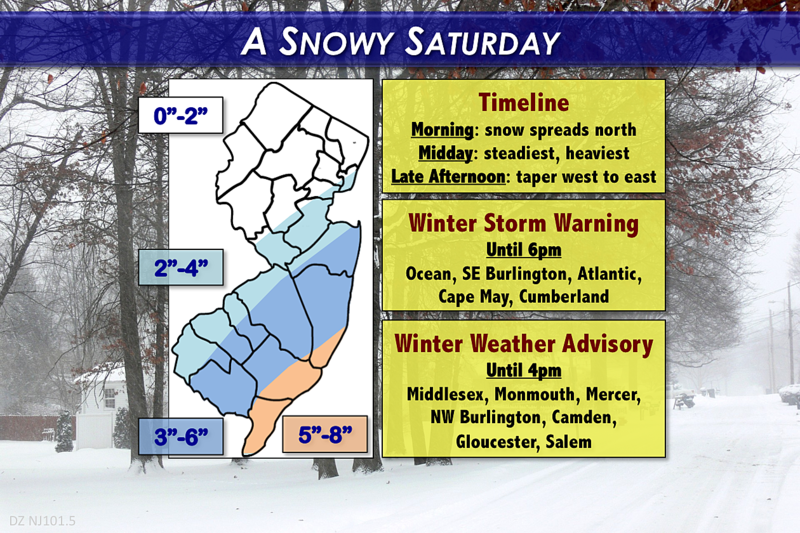 --Winter Storm Warning until 6 p.m. Saturday for Ocean, SE Burlington, Atlantic, Cape May, and Cumberland counties. --Winter Weather Advisory until 4 p.m. Saturday for Middlesex, Monmouth, Mercer, NW Burlington, Camden, Gloucester, and Salem counties. While the impacts of a warning are more serious and urgent than an advisory, everyone in southern and central New Jersey should be prepared for periods of poor travel conditions on Saturday and Saturday night. Low visibility during periods of moderate to heavy snowfall and reduced traction due to snowy roads are likely. You'll need to check current conditions and the short-term forecast before venturing anywhere on Saturday. And be sure to clear your car of any and all snow, including windows, headlights, and taillights. As of this writing, the snow has already arrived for the southern third of the state. It will continue to spread northward through Saturday morning. Peak snowfall intensity is expected around midday, from about 9 a.m. to 3 p.m. Snow will taper from west to east somewhere in the late afternoon to early evening time frame, as the storm system slides away. Snowflakes should be done by 8 p.m. at the absolute latest. As I mentioned above, snow totals have been tweaked upwards slightly across the entire state. The "miss" scenario seems to be off the table now, with significant snowfall likely across New Jersey's southern coast (at least). The big question is where the sharp cutoff occurs - in other words, the dividing line between "snow" and "hardly any snow". --5 to 8 inches of fresh snow accumulation are expected across the southern coast of New Jersey. This includes Manahawkin and LBI in Ocean County, Atlantic City and Mays Landing in Atlantic County, and all of Cape May County. --3 to 6 inches of new snow is forecast for most of Monmouth County (including Long Branch, Belmar, and Freehold), interior Ocean County (including Brick, Jackson, and Toms River), most of Burlington County, parts of Camden and Gloucester counties, the eastern half of Atlantic County, and all of Cumberland County. 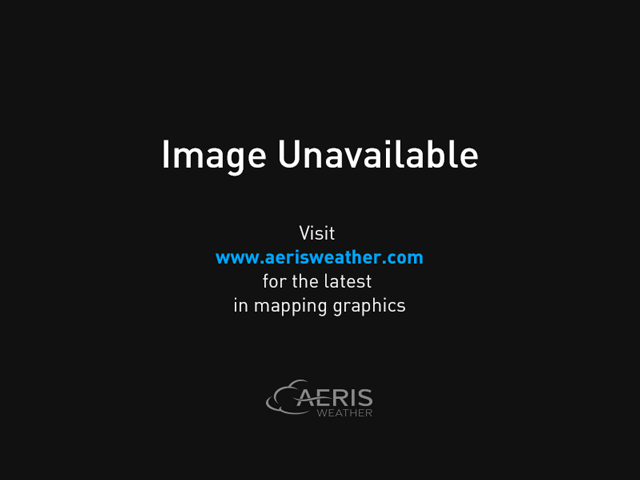 --2 to 4 inches for the NJ Turnpike corridor, including the edges of Hudson and Union counties, most of Middlesex County (including Edison and the Brunswicks), the northwestern portion of Monmouth County (including Hazlet, Manalapan, and Allentown), and the western parts of Burlington, Camden, Gloucester, and Salem counties. --0 to 2 inches for North Jersey, mainly north and west of the Route 1 corridor. The fact it's Saturday will certainly lessen the impact of this snowstorm, as most New Jerseyans are home from work and school. But it's still going to be a serious taste of winter for the areas that receive a half-foot of snow. I'll be manning the weather center all day, providing regular updates on-air and online. Our news and traffic teams are also up early and ready to update you on the latest road conditions, airport delays, closings and delays, power outages, etc. Knowledge is power during this snowstorm - and especially important as the forecast remains in flux and conditions will change constantly. Be smart, be safe, and enjoy the snow!